Posted on 09/02/2015 by Mickey McCarter	in Interview, Live Review and tagged dance, folk, Interview, Laura Burhenn, The Mynabirds, U Street Music Hall. Laura Burhenn’s project The Mynabirds released their third album Lovers Know via Saddle Creek on August 7. Laura once called DC home before she migrated to Los Angeles to start The Mynabirds, and she’s returning for a hometown show at U Street Music Hall on Saturday, Sept. 26, as part of her tour in support of the new album (which starts tonight in San Diego). Parklife DC had the sincere pleasure of chatting with Laura about her new stuff, her DC roots, and subversive pop songs. Mickey McCarter: I actually had the opportunity to see you perform when you were here at the POV Lounge at the W Hotel over the summer, and you played some of the new songs off the new album! The audience loved the new stuff, and I’m wondering if you’re finding that same level of excitement everywhere? Laura Burhenn: Yeah, it’s been really fun. We just played Santa Monica Pier out here [recently], and we played to 20,000 people, which is the biggest crowd I’ve ever played to as The Mynabirds. And it was really special. This album is probably more epic than anything I’ve done before, and the songs worked really well in a live show. It’s really fun to play new songs for people. You have that moment where, wow, you don’t know if they will like it or not like it! The DC show as so fun. We had played for The Pixies [on May 31 at the 9:30 Club], and that was really incredible. It was the first show where we played the new record at all anywhere. So debuting those songs at the 9:30 Club was so poetically perfect, coming from DC. And then to play that show at the W with that insane thunderstorm happening! I feel like anyone who came was a really warrior. That lightning was intense! MM: You say the new album is more “epic.” Can you elaborate? So I made a playlist — it’s still up on Spotify. If you search under Mynabirds, you’ll see the playlist. It’s all over the place. It’s got Kate Bush, Sinead O’Connor, PM Dawn, My Bloody Valentine. It’s 90s hip hop and trip hop and R&B and shoegaze and all this ’80s synthpop. And of course Leonard Cohen. I wanted to incorporate a lot of different things, and Bradley helped me to get to this perfect middle point where it all came together. The last record [Generals] was pretty much all about the rhythm and melody because I wanted it to feel like songs that you could sing if you were protesting in the street, and you were marching and singing at the top of your lungs. But this record is way more about performance. MM: It’s interesting that you evoke protest music. I’m fascinated by protest music. There are so many voices just trying to play it safe these days. Somebody will just want to make a good dance tune or make a “hit.” And nobody wants to rock the boat. So it’s interesting that you’ve been out there, with “Generals” and other songs, and trying to perhaps rock the boat a bit. LB: I grew up in DC, and I lived there from 1997 until 2008. And I was there for all of those protests leading up to the Iraq war. And I was there the night Barack Obama night got elected. It was so funny the night of the election where everyone was singing “Na Na Na Na Hey Hey Hey Goodbye” to George Bush. It’s funny. With the last record, I made a very conscious effort to do that. At the same time, I am so inspired by songs that are huge hit pop songs that if you look at them, they are really protest songs. And you might never know! Like “Dancing in the Street.” Do you know the story behind that song? MM: I don’t, right off the top of my head. LB: There’s that amazing version that David Bowie did with Mick Jagger. If you’ve ever seen that video, they are so coked out of their minds! It’s so amazing. I love that kind of subversive pop culture stuff when people are really successful at that. I also love Michael Jackson. His stuff is more overt, but I love it. On this record, songs like “Wildfire” or “Shake Your Head Yes” are pop songs, but in a way where I wanted them to be dance songs with that seed of “Generals” in it. Saying “We are wildfire” is the same as “calling all of my generals.” It’s the same sort of vibe. MM: I’m glad you mentioned “Wildfire” because the audience you had at the W when you debuted it there absolutely loved it. They were instantly comfortable with that song — and it wasn’t like they were hearing it for the first time, although they were. It was like they knew it already, and I think that’s a remarkable achievement. LB: Thanks! Artists are always trying to write that song that people feel like they already have known forever. And so that song was so fun to write. I had this idea in mind where I wanted it to be a big dancepop song and my producer Bradley came up with that bassline. I wasn’t sure about it at first. But I had to laugh because it reminded me of [the band] Arrested Development! He doesn’t have the same pop culture references that I did, and he missed the reference. Well, you accidentally put exactly what I wanted into the song, Bradley. MM: I wanted to ask you a couple of questions about DC, given that you started out your music career here before you moved to Los Angeles. A lot of things have been happening here, and DC is getting more attention as a city for its music scene. It has a lot to do with its venues, and a lot to do with bands that grow up here like yourself and GEMS and move on and then the bands that stay put and create a scene like Paperhaus. Do you have any thoughts on how it’s grown? You come back and see how it is changing. Any thoughts on what’s happening? LB: DC has an incredibly diverse past, and I love that it has its musical heritage. Back in the day before it was the punk Dischord city, it was the place where jazz was alive and well. It’s got these pockets of things that come out of this place, and it’s such an international city at the same time. I’m so fascinated by it. The scene is so incredibly rich. I really enjoyed being in Georgie James with John [Davis] from Q and Not U, and being part of that Dischord scene, because that part will be there forever. It’s like people make those marks, and they live on. With Georgie James, it was a new era. It was a real musical melting pot. Even though we didn’t sound alike, we were all part of this Dischord family. Having been there and having gone away, I still feel an attachment to it. When you see a band like GEMS making great songs and getting great press, you have to say, “Go, DC!” As someone from DC, it’s exciting to see that it still has this living legacy of being a musical city. MM: It’s great that you still feel like you are a part of that history. LB: The more I’m talking, the more I remember! MM: Ha, y’know that would be a nice duet — you and Hamilton! LB: Totally. We also have a connection through Richard Swift, which I love. Richard produced my first two records, and he also produced the Walkmen’s stuff. It’s funny how the music world can be very small. MM: Anything to add before you have to go? LB: It’s so funny to put out a record after working on it for two years. And then you start touring, and everybody thinks of that as the beginning. I’m in that phase where you are starting over. And I’m really excited to get back to DC. I’m excited to play U Street Music Hall because I haven’t played there yet. I haven’t even seen a show there yet! I was close to that whole area for a lot of years. And it’s crazy to see how much it’s changed. But it’s fun to go back as a tourist — and also fun to know some of its secret history. 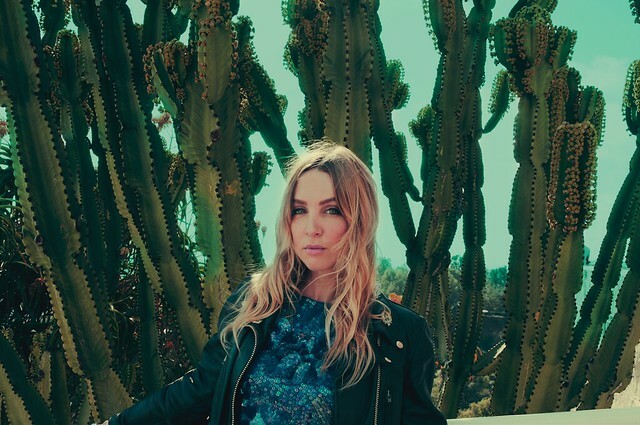 The Mynabirds kick off a US tour tonight, Sept. 2, in San Diego. And later this month, Laura and her band perform at U Street Music Hall on Saturday, Sept. 26, with openers Stranger Cat and Bad Bad Hat. Tickets are available online! Be prepared, as this one may sell out!